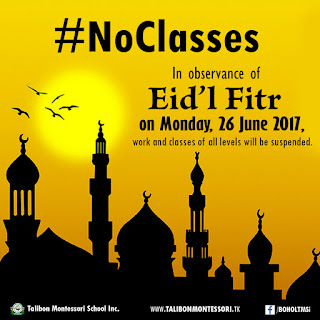 "The school for the holistic development of your child.."
#NoClasses on Monday, June 26, 2017. Holiday. Eidul Fitr is an important celebration for Filipino Muslims, marking the end of the month-long fast during Ramadan and marks the beginning of the month Shawwal. President Rodrigo Duterte has signed the proclamation declaring June 26, 2017 (Mon) as a holiday for Eid’l Fitr. 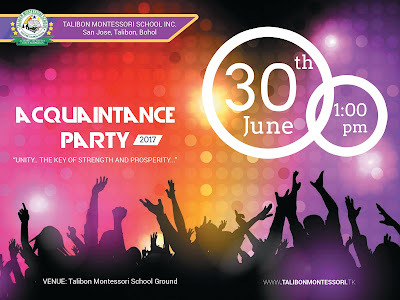 ©2017 Talibon Montessori School, Incorporated. All Rights Reserved.